The Portsmouth History Society looks back on what was making the headlines in the Sports Mail on Saturday, February 16, 1991. England midfielder Paul Gascoigne scored twice in the second half as Spurs came from behind to knock Pompey out of the FA Cup, watched by 26,049 at Fratton Park. Gary Lineker wasted two good chances for the visitors, and it was Pompey who went ahead thanks to Mark Chamberlain’s low shot in the 41st minute. Guy Whittingham saw a header saved by Erik Thorstvedt, before Gascoigne leapt to head Paul Allen’s centre past Andy Gosney with an hour gone. Gascoigne scored the winner with five minutes left as he collected Pat Van den Hauwe’s pass and beat two defenders before firing low into the corner. Pompey: Andy Gosney, Warren Neill, John Beresford, Warren Aspinall (Shaun Murray), Graeme Hogg, Lee Russell, Steve Wigley, Martin Kuhl, Colin Clarke, Guy Whittingham, Mark Chamberlain (Darren Anderton). Spurs: Erik Thorstvedt, Justin Edinburgh, Pat Van den Hauwe, Steve Sedgley, Nayim, Gary Mabbutt, Vinny Samways (Phil Gray), Paul Gascoigne, Mitchell Thomas, Gary Lineker, Paul Allen. Also in the FA Cup fifth round, Cambridge United thrashed Sheffield Wednesday 4-0, Notts County secured a single-goal victory over Manchester City at Meadow Lane and West Ham claimed a 1-0 win at home to Crewe Alexandra. Arsenal won 2-1 against Leeds United at Elland Road in a fourth-round replay. Teddy Sheringham scored all four Millwall goals in a 4-1 win at home to Plymouth Argyle in Division Two. 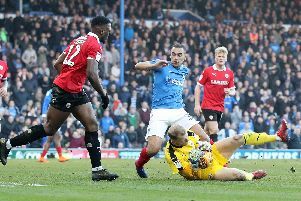 AFC Bournemouth lost 2-1 Birmingham City at Dean Court in Division Three, and Aldershot’s fourth division clash at Maidstone was postponed. In the Beazer Homes League, Gosport went on the goal rampage before Newport’s lowest gate of the season, crushing their hosts 4-0 in a one-sided match at St George’s Park. Fareham came from behind to beat bottom club Corinthian in a relegation dogfight at Cams Alders. The Fareham goals were scored by Kevin Maddock and Paul Marks. Bognor beat Grays 3-0 in the Vauxhall League at Nyewood Park. Mark Hateley was on target for Rangers in a 2-0 home victory against Motherwell in the Scottish Premier Division. Exeter City’s Murray Jones was sent off after 55 minutes of his side’s 1-0 defeat at Brentford in Division three. Port Vale signed Dutchman Robin Van der Lan for £80,000. In the Rugby, England remained on course for the Grand Slam by grafting out an unspectacular Calcutta Cup win over Scotland, winning 21-12. Ireland outscored Wales by four tries to two – but still had to settle for a 21-21 draw at Cardiff Arms Park.